I can describe my artistic style as classic fine jewelry style. A lot of things can inspire me: I love nature and flowers, birds and butterflies. Color combinations that you can find in nature are amazing. I like gemstones. And of course, music inspires me too. I like seed beads, crystals, gemstones and other interesting materials that can be considered unusual, like beetle elytra and dried beetles. One night I had a dream and when I woke up I knew I have to make this piece. In this necklace I wanted to show the water of the East River at night, the Brooklyn bridge and its lights, the skyscrapers glowing in the night and the sky. So there are three parts in this necklace which are clearly defined. It is a bold and spectacular evening necklace. And you can hear Frank Sinatra's song New York, New York! It's "king of the hill and top of the list" type of thing. I planned it out carefully. I chose the materials very carefully. The main color is black, but there are more than a dozen types of beads used. I drew the design; I carefully measured the neck part. Each bead had to fit in its place and it did! It was really hard work and there were technical difficulties. When I saw that something was not going as it should I redid it. Several times. Until everything fit. I started making jewelry about 2 years ago. And before that I was doing pearl embroidery which is an old traditional type of embroidery in Russia (pearl frameworks for icons). Once I saw beaded necklaces by Sherry Serafini and was amazed at the possibilities that beads give an artist. Nobody in particular, I just saw bead works of other artists. I am a designer, embroiderer and a member of the Russian Union of Artists. I enjoy flower growing and photography. Jewelry-making is my full-time career and it plays a great role in my life! My art is my life. I express myself through it. I have a website; I sell my jewelry through the internet. I have some long-time clients, who buy from me regularly. And I participated in Bead Dreams 2011 contest. 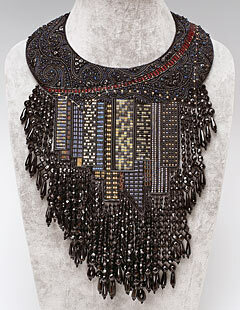 I took 3rd place in beaded jewelry nomination as well as People's Choice Award for my necklace--Manhattan Night Lights. Dream, work hard, set goals and do your best to achieve them. Educate yourself, try to do something new. And do your best to produce the best quality technically and artistically. 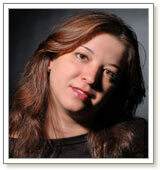 View all of Irina's designs in the Gallery of Designs.